FOR some time past there has been noticeable a certain activity among American aeroplane manufacturers, consequent no doubt upon the increased interest being taken by the U.S. Government in military aviation, which it is hoped will lead to the handing out of substantial orders very shortly. It is also not unlikely that some of the firms hope to do considerable business with European Governments, and it is interesting to notice how the general design of some of the latest machines approximates very closely to those which have proved most successful over here. This is clearly shown in the photographs which we reproduce of some military tractors that have recently made their first appearance, and passed their preliminary trials. Like the Gallaudet machine, the Heinrich military tractor may be said to belong to the "Arrow" type, having slightly back-swept main planes, of which the upper has a pronounced overhang. These extensions are braced in a downward direction by cables running to the lower ends of the outer pair of interplane struts, but no provision has been made, it appears, for bracing them upwards either by means of king posts or some similar arrangement. The body is of rectangular section, and is armoured in front so as to protect, as far as possible, the engine, observer, and pilot. With the new 110 h.p. Gyro motor, which is, by the way, the first motor of that type to be delivered, a speed of 46 to 90 m.p.h. is anticipated, a very good speed range for an armoured machine. For a span of 35 ft. and a length of 24 ft. 6 ins., the machine has a weight of 950 lbs. 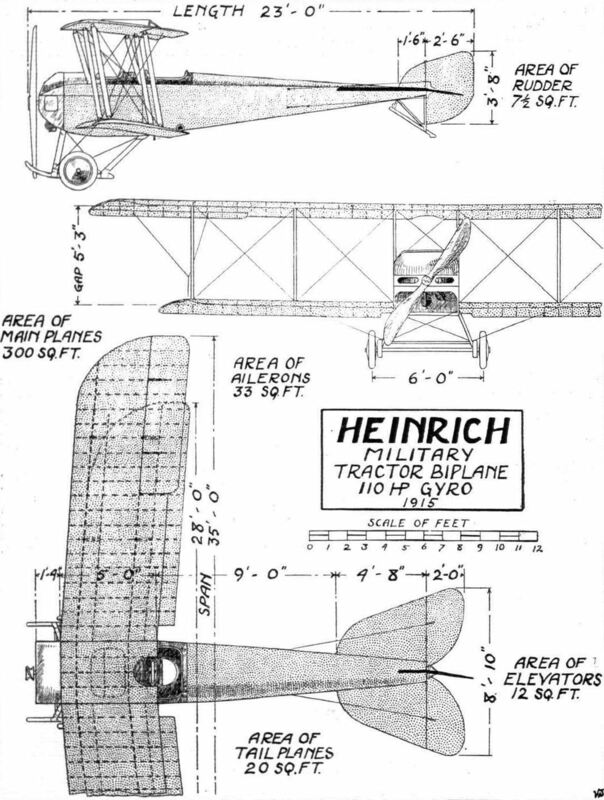 THE HEINRICH MILITARY TRACTOR BIPLANE. DESIGNED primarily with the intention of meeting the U.S.A. Army's and foreign governments' requirements, prominent amongst which may be mentioned fast climbing, good speed range, and general stability, the Heinrich tractor biplane is an interesting example of recent American practice. It must be admitted that this machine certainly possesses more originality in design than some of the military machines lately turned out away yonder. Heinrich Brothers, of New York, have been constructing monoplanes for several years now, and this machine, which, by the way, was designed and constructed in record time, is their first biplane. As far as actual performance goes the Heinrich biplane put up a decidedly good show on the first time of asking, when Albert S. Heinrich, accompanied by Mrs. Heinrich, climbed it at the rate of about 1,000 ft. per minute. Subsequent flights brought out further favourable points - a speed range of 45 to 80 miles per hour, climbing speed with pilot and passenger and fuel for four hours of 4,000 ft. in 10 minutes. Flying light, a speed of 90 miles per hour has been attained. We believe large-works have been taken over by the Heinrich Company for the purpose of building these machines to the order of one of the European Governments. Two of the outstanding features of the Heinrich biplane are the short and very broad body, accommodating the pilot and two passengers - side by side - and the swept-back wings. The latter are virtually in four sections, the top plane being in two and attached to a small central panel mounted above the body by four struts, and the bottom plane in two attached direct to the body. Each section is built up on two main spars of I section, the webs being of ash and the flanges of spruce. The front spars are situated 9 ins, from the leading edge, and about 2 ft. 9 ins. from the rear spars. The ribs, which are spaced 9 ins. apart, are built up of ash webs and spruce flanges, reinforced where the interplane struts are attached to the planes. Laminated four-ply ash is employed for the wing tips, which are rounded off Morane fashion. The top plane is staggered forward 9 ins., and both top and bottom planes are inclined backwards 5#. Each top and bottom section is separated by two pairs of struts, and ailerons measuring 8 ft. 3 ins. by 2 ft. are hinged to the rear spars of the top plane only. The whole of the framework is covered with unbleached Irish linen, doped with a special grey varnish. The tail planes consist of a triangular stabilising surface in two sections, one mounted on either side of the body, two elevator flaps, and a balanced rudder in between the latter. Two types of control can be fitted, either the Deperdussin type, consisting of wheel and rocking column for ailerons and elevators respectively, with footbar for the rudder, or else a "three-in-one" control. Dual control is also fitted if required. The body is of rectangular section, 3 ft. 4 1/2 ins. wide by 2 ft. 9 ins. deep in front, tapering at the rear to a horizontal knife edge 13 ins. wide. The longitudinals are of ash tapering from 1 1/2 ins. square to 1 in. square. There are seven sets of stout channelled ash struts, which together with wire cross-bracing, make for a strong box-girder of the whole body. The second and third pairs of vertical struts are made extra stout to carry the four struts supporting the top plane, and are slotted at their lower ends to receive the ends of the lower plane spars. On the top of the body is a turtle deck providing a good stream line, which is further preserved by almost totally enclosing the engine by an aluminium cowl. Slots are cut in the front of the latter in order to allow air to enter and circulate round the engine. The aluminium covering is carried back to just forward of the passengers' cockpit, aft of which the body is covered with fabric doped the same as the planes. The engine, a 110 h.p. 8-cylinder Gyro rotary, weighing 270 lbs. - the first of this horse-power to be turned out - is mounted in the nose of the body with both front and rear bearings, the front and rear mountings being of 3/32 in. reinforced steel, whilst the struts carrying the rear mounting are extra large (2 ins. by 3 ins.) and unchannelled. Coupled direct to the engine is a tractor screw 8 ft. diameter by 6 ft. pitch. Petrol and oil are fed to the engine by gravity from a service tank holding 15 gallons of petrol and 10 gallons of oil in front of the pilot's seat. The petrol service tank is supplied with petrol from a 25 gallon tank under the pilot's seat by pressure, a hand pump also being fitted for use should the pressure feed fail. The petrol and oil consumption of the 110 h.p. Gyro is said to be 10 gallons and 11/4 gallons per hour respectively. A simple but strong under carriage is fitted, consisting of two skids connected to the body by four ash struts measuring 1 1/4 ins. by 3 ins., and a pair of 26 ins. by 4 ins. disc wheels. The skids are of 5-ply laminated hickory, 4 ft. 6 ins. long, 2 1/2 ins. deep by 2 ins. wide, turned lip in front and projecting forward to protect the tractor screw. The axle is attached to the skids by rubber shock absorbers. The whole of the chassis is cross braced by wire, and two steel tubes. The armoured Helnrich military tractor equipped with a 110 h.p. Gyro motor. 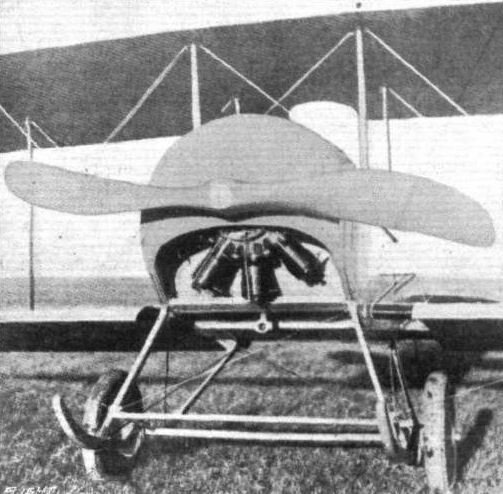 Three-quarter view from the rear of the Heinrich military tractor biplane. 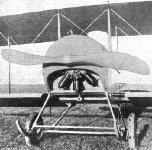 View showing the 110 h.p. Gyro engine mounted in the Heinrich military tractor biplane. Diagram showing the wing section of the Heinrich military tractor biplane. THE HEINRICH MILITARY TRACTOR BIPLANE. - PIan, side and front elevations to scale.